In this business your work is, well, your work. Creative yes, but work nonetheless. Work you enjoy and hope your clients will. This particular Bride was especially happy. 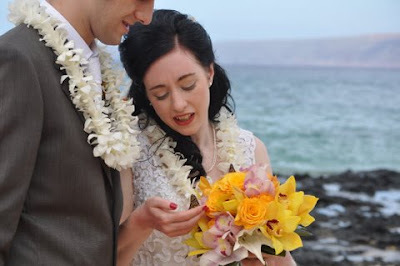 Her venue was a little known cove on the southern shore of Maui. Her Groom was handsome and attentive. Her weather was absolutely perfect! And, her bouquet, from Dellables was graced by a cooperative butterfly. It's enough to make us smile all day long!